In part 1 of the Leaders division coaches hot seat, we looked at Illinois, Indiana and Ohio State. 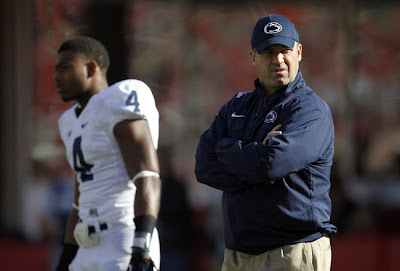 Rounding out the division in this post is Penn State, Purdue and Wisconsin...who's coaches have a combined 1 year of Big Ten head coaching experience. This could be interesting, although no one is on the hot seat here. Here's our own custom "hotness" scale, for your reference. Needs a Good Year - Needs to improve from 2012. Needs a Great Year - 2013 could be the end if things don't get better fast. No question O'Brien has one of the toughest jobs in the B1G. I can't imagine any way in which he's overly successful this season. But maybe that NFL pedigree will serve him well as he just needs to focus his team on football and the business of getting their minds off of the circus that's going on around the program and school. Well, he did just that. I did not expect 8-4, especially after the opening loss to Ohio University. But O'Brien has kept his team focused despite the legal mess going on around the program and the university. However, things are going to get tougher for the Nittany Lions as they manage their way through year two of the NCAA sanctions that are hanging over the program. The post-season/bowl ban and scholarship limitations will eventually take their toll. And while I think BOB is absolutely the right man for the job in Happy Valley, things are going to get worse before they get better. And that's a shame. But that doesn't seem to be slowing BOB down. He's recruiting well, and even turned down multiple NFL offers this offseason. If he wanted to just prove himself and leave town, he had his shot, and stayed. I think that says a lot about Penn State and even more about O'Brien. If he's thinking staying long-term at Penn State, he could be a great coach for them. I'm glad to have the Nittany Lions back on the schedule and I'm even more glad to be in their division starting in 2014.
Who the heck is Darrell Hazell? 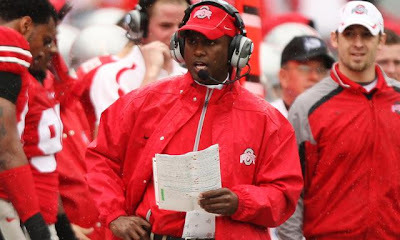 Well, my Boilermaker-hating brethren, he's the next in a very long line of Purdue head coaches...20th to exact. Hazell hails from New Jersey originally. He went to school at Muskingum University in Ohio. Most recently, he was the head coach at Kent State for the last 2 seasons. He held assistant coaching positions previously at Oberlin, E. Illinois, Penn, W. Michigan, Army, W. Virginia and Rutgers. But the most important thing you need to know about Hazell is that he was WR coach at Ohio State from 04-10. I knew there was something I didn't like about the cut of Hazell's jib. But seriously folks, let's not kid ourselves, we're very happy to see Danny Hope get the boot. And even if it means getting Hazell in his place, I consider this a step in the right direction. Hazell is going to have his work cut out for him. Purdue loses 6 offensive starters, including QBs Robert Marve and Caleb TerBush, from a team that went 6-7 and 3-5 in the Big Ten. He does receive 9 defensive starters back, so that's a plus. Either way, it beats having Danny Hope back for 4th year, so there's that. Purdue probably won't see a bowl game this season given the rebuilding that will likely take place, plus their schedule doesn't do them many favors. It'll be interesting to see how things play out. Welp Wisconsin, Bret Bielema dumped you for Arkansas, huh? That's rough. Sorry 'bout that. Three straight Big Ten championships. 3 straight Rose Bowls (all losses)...those are some big shoes to fill. Since 1990, Wisconsin has enjoyed relative coaching consistency and success between Alvarez (118-74-4) and Bielema (68-24). Now Wisconsin turns to an outsider to lead their program into the new and scary world. 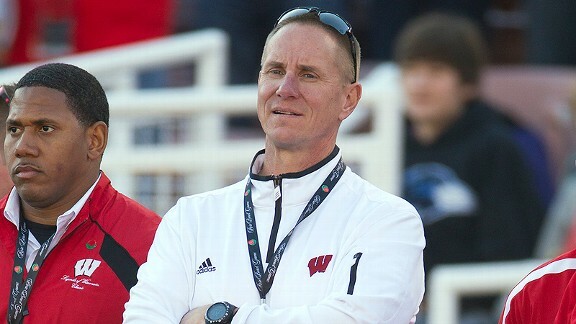 Gary Andersen hails from Salt Lake City, Utah. He was most recently the head coach at Utah State where he went 26-24 over 4 seasons, but 11-2 in 2012 with a win in the Famous Idaho Potato Bowl. Andersen was responsible for turning Utah State around. Prior to his 3rd season there in 2011, the Aggies endured 11 losing seasons in a row. One thing that I found very interesting about Andersen, as well as touching, is that once he decided to take the Wisconsin job, Andersen personally called every Utah State player himself to inform them of his decision. That's nice. Bielema left the cupboards relatively stacked for Andersen with 8 offensive and 7 defensive starters returning from last year's Big Ten championship squad. Star RB Montee Ball is gone, but I think backup James White is more than capable of filling in. White ran for 806 yards last year with 12 touchdowns. He and averaged 6.4 yards per carry. QB's Joel Stave and Danny O'Brien return as well as 3 OL starters. If Gary Andersen can get this team playing well early, there's no question they could compete for their 4th straight B1G crown and another Rose Bowl. It's not a complete rebuild, which is what he's used to, but it sound like the Wisconsin players like him so far. I'm wondering if they'll like him too much, making Wisconsin a little softer then they were under Bielema. ~ Up next, Legends Division Hot Seat Part 1. It's Andersen, with an E. Come on, man.